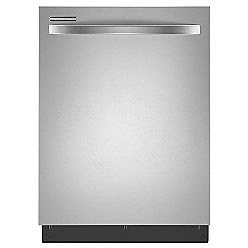 The appliance of the week is the Kenmore built-in dishwasher model 1328X. This dishwasher is available in white (13282), stainless steel (13283), and black (13289). The Kenmore 1328X dishwasher is part of the full-line Kenmore conversion from the old Kenmore logo to the new one. This also involves use of handles consistent with the vast majority of the Kenmore line, with a tapered towelbar handle. The front vent has been slimmed down to be less prominent. There is no logo on the front of the door, so it has a clean and simple appearance. The controls are integrated into the top surface of the door, so the controls are not exposed when the door is closed. The tub is gray plastic, giving it an enhanced appearance. Like the majority of dishwashers, the 1328X has nylon-coated racks for improved durability. The upper rack is adjustable using an easy-adjust thumb lever system, so there's flexibility for taller items on the top or bottom rack. The bottom rack gives you one of the industry's most popular features: TurboZone. And, this is a new and improved TurboZone, with six additional spray jets (two sets of three, facing upward, above the TurboZone) to create additional cleaning power. The Kenmore 1328X, as with the rest of the new Kenmore dishwasher line, has a triple filtration system rather than the old-fashioned grinder disposal. This has increased efficiency to CEE tier 2, and has reduced noise by three decibels versus the prior non-TurboZone model (1389X). Rather than the old 57 decibels, the 1328X is a quieter 54 decibels. Unlike Kenmore Elite models, the filter system uses all plastic components (plastic mesh in the cylinder filter, plastic screen at the bottom). These components are durable but cost less, which helps keep the price down while still increasing efficiency and lowering noise levels. Like the Kenmore Elite models, the wash arms have smaller openings than previous models, to increase pressure and washing power without using more water or energy. The top and bottom racks both have these wash arms, so cleaning performance will be even better than the previous version. If you're looking for a new dishwasher with great cleaning features, fairly quiet performance, good efficiency, and a sophisticated look without a sophisticated budget, the Kenmore 1328X is definitely a dishwasher you should consider. At around $100 less, the Kenmore 1327X eliminates the TurboZone and the top rack goes from thumb lever adjustment to adjusting by removing and replacing the rack on a different set of wheels. It is also available in white (13272), stainless steel (13273), and black (13279).